Let’s unpack them a bit. Personal boundaries are physical, emotional and mental limits we establish to protect ourselves from being manipulated, used, or violated by others. Does setting boundaries in the above example feel tough or easy for you? 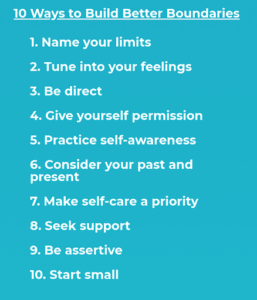 If it feels challenging, take a look at the 10 ways to build better boundaries. I imagine some steps will feel harder than than others. Use that information to understand yourself a little better. What fear, belief, or expectations do you hold that make a step particularly challenging? Do you know someone who is great at setting boundaries? Don’t be so sure. There are six types of boundaries. It is easy to see someone and say they are good at setting boundaries. However, while they may be great at setting work boundaries, they could also have a hard time setting personal boundaries. Each of us may feel a different level of ease with boundary setting in general now or in different parts of our lives. We can have a different relationship to our emotional boundaries than we do to our mental boundaries. Maybe our comfort with setting sexual boundaries differs from our comfort with physical boundaries? Take a look at the infographic and see what feelings arise as you think of boundaries in each of the six areas. Most people have trouble setting a boundary at some point. Are any of these six particularly easy or hard for you? Without judgement, what else have you learned about yourself? Boundaries are deeply personal. They are influenced by emotional factors that may not even operate at the conscious level. For example, insecurity about work deliverables may lead one to labor more than someone who feels like promotion is inevitable. Similarly, someone who is driven by being liked will have a harder time setting boundaries with friends than someone who is more attentive to their own self-care. Boundary setting is also often driven by familial and cultural expectations. “That is not how we do things.” Sometimes we want to set a boundary but feel we can’t. “It’s okay if you don’t call me. It is okay if I have no one to talk to. I guess I will just have to talk to myself.” That is a lot of pressure. You can set boundaries without feeling bad. What would make it easier for you is to set boundaries that aren’t driven by fear? A change in perspective can change everything. This series will provide you with steps and practice for setting boundaries. 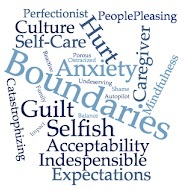 We will explore why this is challenging, how to peacefully address the challenge, practice setting boundaries, and develop a personal plan for setting boundaries. Come and learn how to create healthy boundaries in a safe environment.